The Glooming is a curious mixture of genres and tropes. It has the appearance of a book that might have been ‘written to market’ but the more I got into it, the less I thought this. It has a structure that risks turning many readers off in that it has several interlocking stories (okay, by several I actually mean lots – we’re getting into Magnolia/Short Cuts territory…with the apocalypse, of all things!) and sometimes there is a long gap between them. My favourite thing about this book: I love this kind of writing, and any author willing to risk it in a world where authors are (just in my opinion) avoiding unconventional and long-drawn narratives more and more can have my vote. 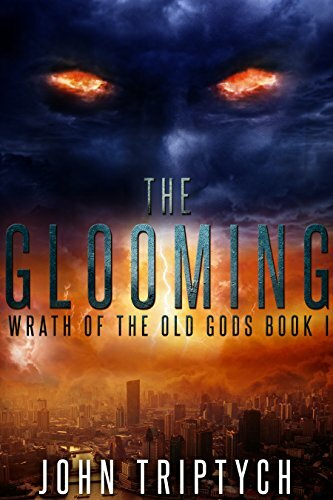 When I first laid eyes on this author’s work via Kboards, I took a pass largely because of one book in the series being entitles Pagan Apocalypse. Really not my sort of combination. The idea of an army of old gods bringing about the end of the world seemed like the stuff of Hollywood disaster blockbusters that go so far into the absurdity that they make millions even on the backs of two star reviews. So what persuaded me to read this? I’ll admit it: it was the cover, and the ‘Free’ pricetag at a time when it felt like forever since I last got paid. Don’t let my initial impressions fool you though. The Glooming is very readable, and I finished it feeling interested in where the story goes next. There were times during this book when I put it down only to go to work or do something else essential, and felt it trying to call me back. That’s the stuff of bestseller page turners. In other places, I felt like I was just going through the motions, but the good moments were worth it. Before you take a pass on the book, don’t let this put you off – I’m nitpicky, and I wish I could read without turning my craft-head off, and if this wasn’t enough to make me drop the book then it probably won’t be for the person I’d imagine to be Triptych’s ideal reader: someone who’s out to have fun with lots of action, explosions, desperation and generally world-ending atmosphere. Next Next post: I win the ‘My First Podcast’ badge!